Modesto is located in the Central Valley area of Northern California, 90 miles north of Fresno, 92 miles east of San Francisco, 68 miles south of the state capital of Sacramento, 66 miles west of Yosemite National Park, and 24 miles south of Stockton. 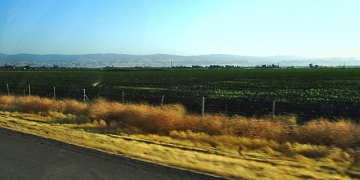 Modesto, a 29-time Tree City USA honoree, (City of Modesto) is surrounded by rich farmland, lending to a ranking for the county as 6th among all California counties in farm production. Led by milk, almonds, chickens, walnuts, and corn silage, the county grossed nearly $3.1 billion in agricultural production in 2011.Modesto was immortalized in the 1973 George Lucas film American Graffiti. The award winning film captured the spirit of “cruising” and friendship on 10th and 11th Streets in 1962 and led to the revival of 1950s nostalgia that included the TV show Happy Days and the other spin-offs. Ron Howard, Harrison Ford and Richard Dreyfuss starred in the film. The soundtrack was a huge success. Director George Lucas is a native of Modesto, graduating from Downey High School in 1962. Patterson is a city in Stanislaus County, California, United States, located off Interstate 5. It is 27 miles southeast of Tracy and is part of the Modesto Metropolitan Statistical Area. Patterson is known as the “Apricot Capital of the World”; the town holds an annual Apricot Fiesta to celebrate with many drinks, food, desserts and games. Turlock experienced extensive growth of both residential and commercial areas in the 1980s, following a statewide boom in housing demand and construction. The housing boom of the 1980s diminished in the early 1990s but increased again in the second half of the decade, partly as a result of San Francisco Bay Area growth, which placed a higher demand for more affordable housing in outlying areas. Following the dot-com bust, housing demand intensified, producing higher house prices in an area formerly known for affordable housing. A recent boom in the retail sector has produced considerable growth along Highway 99’s corridor.